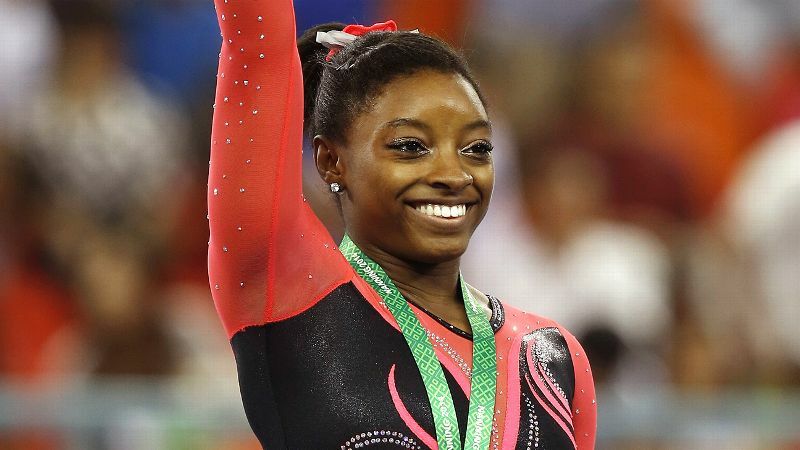 Simone Biles won't be 18 until March, but already has an all-time great gymnastics résumé. And, according to her and many experts, Biles' impact on women and sports may have only just begun. If a gymnasts' performances were accompanied by pop songs, Cyndi Lauper's girl power anthem, "Girls Just Want to Have Fun," would be the obvious pick for Simone Biles. The 17-year-old Texan, who picked up her second consecutive all-around world title and three additional gold medals in October, is known for her explosive power, incredible difficulty of her routines and for having a good time out on the competition floor. Oh, and one very famous near-bee sting. 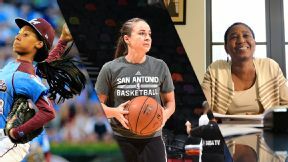 The Impact 25 member sat down with espnW to reflect upon what was an eventful year -- with a busy future around the corner, too. Dvora Meyers: Mary Lou Retton said that you may be the most talented gymnast ever. Do you think she's right? Simone Biles: I wouldn't say that, but I guess she's one of the best gymnasts to ever, like, live. Coming from her, that means a lot. And I think it's an amazing thing to have said about me. She and others have also said that you're unbeatable. Do you feel unbeatable? No, not really. I feel normal. Whenever we go out there, I feel like anyone can beat me. That's not my goal. I just go out there and have fun. How old were you when you started thinking about elite gymnastics and whether it would be a possibility for you? I think I was 13. And I thought, "Oh, I want to try elite gymnastics. It'll be something different." I don't really know what brought me to it. I just wanted to try it for some reason. I wanted to be on the national team, and get assignments and travel. When you first started out as elite, what were your competitive goals? How have they changed as you've progressed and gotten better? One of the first years I did elite, I just wanted to make P&Gs (national championships) and then I heard about the national team and I really wanted to make that. And then I guess they've (my goals) just changed -- as in, now I know what my abilities are and I wanted to use them to the best I can. So make worlds team and get assignments and stuff like that. What's is your schooling like? I'm home-schooled and I have a teacher. I have my sister in the class with me and her daughter (the teacher's), who is a dancer. We see her every day. She either teaches us our lessons or we do it by ourselves. How many hours a day do you spend working with your teacher? I do 7-9 a.m. and then 12:30-2:15ish three days a week. And then the other two days a week, I go 8-12. So it's 3 to 4 hours a day. And then I have homework. A lot of people would assume that since you won the world championships twice, you're being offered all kinds of lucrative sponsorship opportunities. But you are forgoing those to do NCAA gymnastics. Why do you want to do college gymnastics so badly? It's something fun to do. That's pretty much everyone's goal whenever you enter gymnastics -- "I want to do college gymnastics" -- besides wanting to go to the Olympics. I think it'd be so much fun to finish your career off as a college athlete. And college gymnastics is a lot more fun than elite, where you're so serious all the time. Speaking of fun, I think a lot of people have gotten to know you as the kind of gymnast who seems to have a lot of fun. What is the most fun memory you have of 2014? At worlds this year, winning (the team championship). I think that was most funnest ever because it was a team event. So having all of us go out there and compete, I think that was the best. What made team more special for you than the all-around? We all work so hard throughout the year and we all just want one thing: to go out there and compete as a team and do our best. I think that's what we did. Pretty much, we're sisters. It's your family cheering you because they want the best for you. It was so amazing and so fun to be out there and train with them. Oh gosh, the bee. Seeing those pictures that night, I was crying, laughing. What was going through your head when you saw the bee? I just remember thinking that I have never been stung by a bee, so get away from this thing. And I was like, try not to make a scene. I'm terrified of bugs, so, "Stay calm, Simone, shake it off, shake it off, it's OK." Obviously that didn't happen cause I ended up running around the podium like a psycho. What is something that you've done recently that made someone else laugh? In the gym, I dance a lot. Or just the other day, I peeled off the bar and that was really funny. To other people, that wouldn't be funny, but to us gymnasts, we live for those crashing moments sometimes. What is it about crashing videos or crashing moments that's so funny to gymnasts? We never get to see ourselves doing anything unless we watch videos. So whenever we crash, we're like, "Wow, that was me." For me, I'm so bad. I laugh at anything. Somebody could fall and they could start crying, and I'm over there laughing. I don't know why I laugh. I guess I get scared for them so I have to laugh. I don't know what it is about crashing that cracks us up. We just laugh. Isn't it a way of dealing with an uncomfortable emotion? Maybe it's so that whenever we crash, we're not embarrassed. We laugh so that other people will laugh with us. They're not laughing at you. Or just you don't know how to react, so your first thing is to laugh. As long as no one is hurt, it is kind of funny. Yes, as long as they're not hurt. If they're hurt, I stop laughing immediately. What is your ideal version of what the next year of your life will look like? Next year will be a pretty crazy year, with the media and talking about the Olympics and stuff like that. Hopefully I'll make American Cup in March, then gear up for competition season, and then making the 2015 worlds team. And then it'll be the Olympic year, and that'll be really crazy. I don't even want to think about it. A lot of the routines and the skills that you did this year looked kind of easy for you. How are you thinking about challenging yourself gymnastically next year? I'm thinking of upgrading some of my routines and then cleaning up. But I'm going to try to upgrade a couple of things. Describe your gymnastics style in a few words. What sort of legacy would you like to leave when you eventually retire? I've never thought about that. I guess I'd want little kids to look up at me and say, "Wow she had so much fun." Gymnastics doesn't always have to be serious. We can have fun and be good at it.